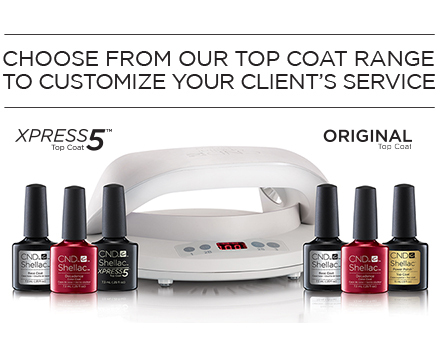 Give your clients a superior service with the SHELLAC® Brand 14+ Day Nail Color system. Featuring a Base Coat, Color Coat and Top Coat – and the exclusive CND® LED Lamp – the SHELLAC® Brand system works together like no other to deliver two weeks of high-performance wear with no nail damage*. Our most advanced top coat designed to strengthen and protect nails against breakage and daily wear. The ultimate combination of textures, without compromising gel polish wear. Available in Pearl, Matte & Glitter finishes. Trial Packs include everything needed to perform the full system at a special value price.